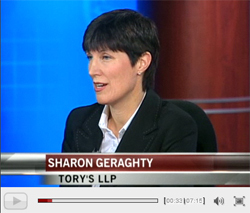 There's a valuation disconnect between buyers and sellers, says Sharon Geraghty in an interview on Business News Network's (BNN) Market Morning: sellers will have to accept lower premiums than in the past. It's a buyers market and sellers can no longer expect to auction themselves off to the highest bidder. But sellers today are also asking tough questions. They are asking buyers, "Show me the money" because in today's markets, there is no guarantee that a buyer will be able to raise the necessary capital. To read the interview transcript, click here.